Do you have an account with Bank of Baroda? Do you have the passbook and get it updated regularly? Of course not! It is practically not possible to update the passbook regularly. But, it is essential to keep detailed info of the transactions and account details in real time. Do you know about mPassbook? It is the age of mobile apps, and mPassbook is an app where the account holders can keep a track record of the transactions in their account. 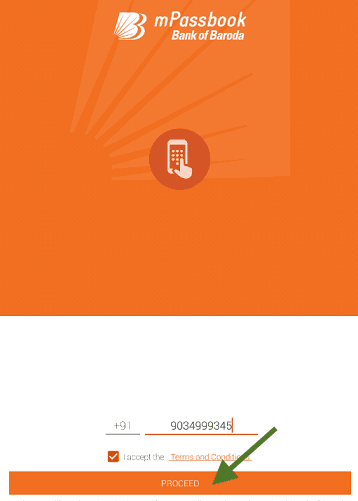 If you have an account with Bank of Baroda, you can download the app on your Smartphone and use the features. You can get the account statement being anywhere at any time without downloading the statement in PDF or CSV format. You can use the app to search, filter and find a particular transaction in the account. The account holders can tag a transaction as well as add remarks for the transactions. The app works in the offline mode providing updates till the last sync. You can obtain real-time transaction updates. Users can track the expenses with the expense manager feature. Users can also track any nearby ATM within 10KMs. Users can use the app for Savings, Current, OD, Deposit, CC or Loan Accounts. Step 1: Search for the Bank of Baroda mPassbook App in the Google Play Store or iPhone App Store or Windows Store as applicable. Download the app and get it installed. Step 2: After installation, open the app and select the desired language. Click the Proceed button. Step 3: You have to enter the ten digit mobile number registered at the bank and linked to the account and click the proceed button. Step 4: For verification, the app will send an SMS from the registered mobile number (Set as default). You will receive a 6 Digit OTP on the registered mobile number which you need to enter to proceed to the next step. Click the continue button. Step 5: After validation of the OTP, you need to set a four-digit numeric PIN. Important Note: You can't reset the PIN. If in case you forget the PIN, you can't log in to the app. You have to reinstall it after removing the app from your phone. Using mPassbook app is free and convenient for users unable to access the bank. Make sure to provide the registered mobile number to access the services and facilities.